At the 9:15 AM service this morning, the Rt Rev. John Vaughan, Bishop Ordinary of the Diocese of the Eastern United States (ACA) installed Fr Guy Hawtin as the Dean of the Northern Pro-Cathedral. Bishop John’s home parish in Florida is the Southern Pro-Cathedral. 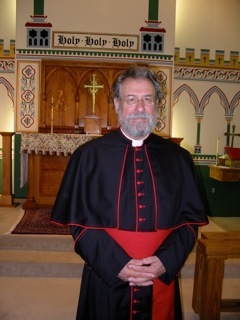 Having Fr Hawtin as Dean will facilitate the management of the diocese’s administrative affairs. Isaac live streamed the installation ceremony on Facebook. You can check it out here.